Boxitale’s special game system uses an app to stream an original animated adventure series, and while kids use the phone during the play, they practice craft and creation 80% of the time on the actual board game, while the phone/iPad is positioned on the 3D arena and not in their hands. Play the story on the board, while getting clues from the app! 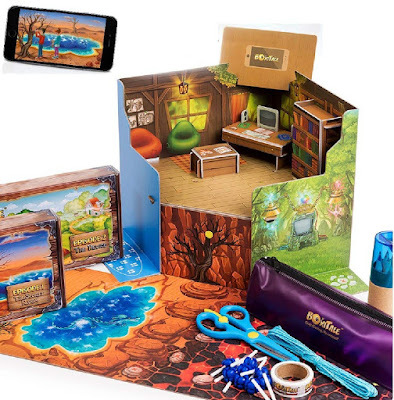 Boxitale offers a new type of game experience where children can actively play the story. Suitable for Children 6-10 years of age! Download the free app on your device. Play with your smartphone tablet. Boxitale stories can be played as a single player and as a group. A game can take between 45 min. to an hour for 1 episode (2 episodes are included in the game box, more available for purchase). Children develop STEM skills while playing this game. Learn and expand knowledge through the integrated app game experience - practice technology, engineering, problem solving, analyzing, and integration. Start playing immediately in the app guided by Boxi the robot - he will take you step by step into the adventure. No adult instruction required.